Dragonz is one of the best online pokies released by Microgaming in 2016, full of lively 3D animations, colours, bonus features and heaps of winning potential. Find out how and where to play this exciting new slot game for real money online. Dragonz is a vibrant pokies game consisting of a pack of four adorable baby dragons; Flint, Switch, Frost and Gobble. Each dragon comes with its own quirky personality, coming to life on the reels when they feature in a winning combination. The reels are originally set against a colourful meadow, but there are four landscape backdrops that change as the game progresses. Overall, this game gives off a kind of The Land Before Time vibe and triggers a kind of comforting childhood nostalgia. Dragonz is a five-reel game with 243 ways to win. It features wild symbols, scatter symbols, free spins and four unique wild bonuses. The game offers a potential jackpot of up to 107,500 coins. 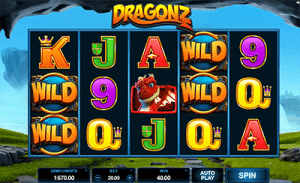 Like all Microgaming pokies, Dragonz is available for instant-play directly over your Web browser and via downloadable software. While most of our recommended casinos only offer instant-play, you’ll find the downloadable version available at solely Microgaming powered sites like Royal Vegas and All Slots. To play Dragonz for real money, sign up for an account with any of our recommended pokies sites using the links in the table above to score some exclusive new player welcome bonuses. Make an instant deposit using a secure payment method like Visa, MasterCard, Neteller, Skrill or Paysafecard and you’ll be all set to start playing for real wagers right away. To select the size of your wager, click the ‘bet’ button at the bottom of the reels. Paylines are fixed, so you just need to set the coin size and number of coins per spin. The only coin sizes available are 0.01, 0.02, 0.05, with the number of coins ranging from one to 15. The minimum bet allowed in Dragonz is $0.40, while the maximum bet is capped at just $30.00 per spin, which might not cut it for the extreme high rollers but is well suited to recreational punters. A lot of love has gone into the design of each of these adorable 3D dragon symbols, with Microgaming really capturing the individual personalities of each character. The dragons make up the high paying symbols, with lower paying symbols consisting of standard 10, J, Q, K and A. There are multiple bonus features to this game, with most of the bonuses circling around the dragon characters, making Dragonz one of the most creative games we’ve seen from Microgaming for a long time. Wild Symbol – When landing in a winning combination, the wild symbol substitutes all other symbols to form a win except for the scatter. 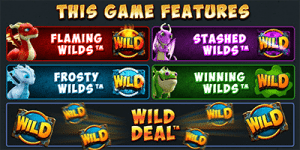 Dragonz also has an innovative Wild Deal bonus, where any non-winning spin that has a wild symbol on the third reel deals three extra wilds onto the other reels for a guaranteed win. This boosted wild significantly increases the winning potential of this game. Scatter Symbol – An appearance of three or more of the orb-like scatter symbols anywhere across the reels triggers free spins. All free spin wins are multiplied by the total bet staked, and all bets are played at the same value as the spin that triggered the free spins bonus. Free Spins – The free spins bonus in Dragonz offers four different free spin rounds, each offering its own special features and different ways to win. The free spin rounds are named after each of the dragon characters, with the backdrop changing for each. The free spins round you get is randomly awarded, until you’ve triggered the free spins bonus 12 times, where you’ll receive the Player Choice reward which allows you to choose which bonus round you play. The Flint bonus awards 10 free spins with Flaming Wilds, where this fierce little red dragon can fire extra wilds onto the reels, shooting an increasing number of wilds each time he fires. 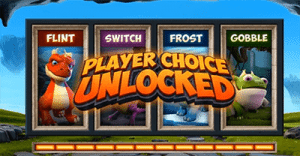 The Switch bonus awards 10 free spins with Stashed Wilds, where the purple dragon stashes away any wild symbols that land during a non-winning spin, to later randomly distribute them once three or more wilds have been collected to form a guaranteed win. The Frost bonus awards 10 free spins with Frosty Wilds, where any non-winning wilds are frozen into place until they contribute to a winning combination. Gobble offers 10 free spins with Winning Wilds, where this chubby green dragon randomly splits wild symbols out over the reels. Dragonz is the kind of game we’ve been waiting for from Microgaming for a while now, restoring our faith that this software developer hasn’t lost its touch. Not only is Dragonz a great looking game with beautiful 3D graphics, it introduces brand new features which we’ve never seen before, providing much more incentive to give this game a go. If you’ve been underwhelmed from Microgaming’s recent releases, try Dragonz to remind yourself why Microgaming is one of the industry leaders for online pokies. It’s worth noting that during our testing, the free spins bonus seemed almost impossible to trigger, although it paid off dramatically when it finally did. For more great online slot games, check out our online slots review page.